GSK has part of the solution to some of the world’s biggest health challenges. Do you have another part? GSK’s science-led approach to the discovery and development of vaccines is coupled with the recogni­tion that research and development (R&D) is strength­ened by collaboration with external partners. In 2017, GSK Vaccines engaged in more than 180 scientific collaborations while investing £621 million in R&D. As one of the leading vaccine developers, GSK is keen to facilitate the exchange of intellectual know-how between the 2,000 scientists at its R&D sites in Rixensart (Belgium), Rockville (Maryland, USA), and Siena (Italy) and academic groups—including gradu­ate and postdoctoral research programs—biotechs, consortia, charities, and pharmaceutical companies. The company forms strategic relationships and col­laborations from early-stage research to late-phase development, and deploys whichever collaborative model is most likely to deliver the right results. GSK seeks to understand how the perspectives, needs, and priorities of its collaborators can further vaccine R&D, and is instilling this spirit in the next generation of vaccinologists through the courses and opportu­nities it provides for PhD and postdoctoral scholars. GSK is looking for more collaborations in the areas shown in Box 1. This inclusive approach, which covers private–pub­lic groups engaged in research at all stages of the vac­cine development cycle, keeps GSK closely in touch with emerging technologies. The company looks for opportunities to apply these technologies across its R&D activities. For example, GSK uses its current plat­forms, such as self-amplifying mRNA (SAM) technol­ogy, adjuvant systems, and structural vaccinology, to support the development of a range of new vaccines to address major public health challenges. 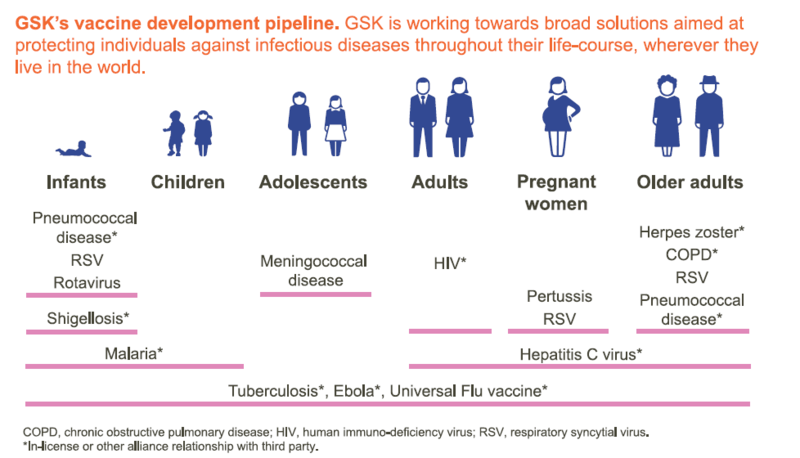 GSK also takes an inclusive approach to protect­ing people from disease by pursuing the innovation needed to develop vaccines covering their entire life course. The company is working across exciting fields, from maternal immunization and support for healthy aging, to anticipation of infectious disease outbreaks and approaches to counter antimicrobial resistance. Through its participation in the REspiratory Syncytial Virus Consortium in EUrope (RESCEU), an Innovative Medicines Initiative project, GSK has joined with more than 50 teams from academia, patient groups, pharma, regulatory agencies, and other fields to integrate the teams’ knowledge about the respira­tory syncytial virus (RSV). The breadth of the collaboration and the scale of its ambition—to develop a vaccine against a virus that causes severe disease in the very young, older adults, and in high-risk groups—are in-line with GSK’s approach to vaccines. In 2005, RSV was associated with 66,000–199,000 deaths worldwide in children under 5 years old1. GSK’s spirit of collaboration is also demonstrated through the development of the malaria vaccine. Fighting such a disease is scientifically very complex because the parasite has the ability to elude the con­trol mechanisms of our immune system. GSK worked with a number of partners, such as the Walter Reed Army Institute of Research, the PATH Malaria Vaccine Initiative, the Bill and Melinda Gates Foundation, and African scientists, as the candidate vaccine moved into clinical testing. The public–private partnership shared expertise, costs, and risks, and after 30 years their joint efforts finally led to a positive opinion granted by the European Medicines Agency and the upcoming pilot implementation in Ghana, Kenya, and Malawi led by the World Health Organization. GSK’s broad roster of R&D collaborations is testi­mony to its willingness to be flexible to achieve the best outcome, and its belief that breakthroughs are enabled when groups combine their different parts of the solution to health challenges. Nair, H. et al. Lancet 375, 1545–1555 (2010). GSK is one of the world’s leading vaccine companies, involved in vaccine research, development and production. We have 15 vaccines in development and our broad portfolio of 39 vaccines prevent illnesses such as hepatitis A, hepatitis B, diphtheria, tetanus, whooping cough, measles, mumps, rubella, polio, typhoid, influenza and bacterial meningitis. Globally, we have more than 16,000 people working to deliver nearly 2 (1.9) million vaccines every day, to people in around 90% (172) of the world’s countries. In 2015 we distributed around 690 million doses of vaccine, over 70% of them to least developed, low and middle income countries.